Irish Distillers Pernod Ricard has announced the launch of Redbreast Mano a Lámh, the first expression in the Redbreast range to be matured solely in ex-oloroso sherry butts. This special whiskey is the latest release from the Midleton Distillery as it aims to satisfy the increasing global demand for new and original Single Pot Still Irish whiskeys. Mano a Lámh, meaning ‘hand in hand’ in Spanish and Gaelic respectively, represents the relationship and passion between the Midleton Distillery and the collective of artisans in Spain, which has crafted the distillery’s sherry butts for more than 20 years. Specially commissioned for the Midleton Distillery, oak is felled in the forests of Galicia, north-west Spain, and then crafted and seasoned by some of the country’s most prestigious family businesses. The Antonio Páez Lobato Bodega in the South crafts the oak into casks, which are then seasoned with Oloroso sherry for two years at the prestigious Páez Morilla Bodega in the nearby sherry capital of the world, Jerez. The freshly seasoned sherry butts are then shipped promptly, during the cooler winter months, to the Midleton Distillery where they are then filled with new make pot still whiskeys. Redbreast Mano a Lámh is being released exclusively to members of The Stillhouse, the web-based members club for Single Pot Still Irish whiskey fans. The Stillhouse forms part of the www.singlepotstill.com website, which launched in 2011, to educate discerning whiskey lovers about the quality and provenance of this unique style of Irish whiskey. While the core Redbreast range is matured in a combination of American bourbon and Spanish oloroso butts, Redbreast Mano a Lámh luxuriates in this signature sherry style by bringing together whiskeys which have been matured exclusively in first fill Spanish oloroso sherry casks, imparting distinct, rich, fruity flavours and a full body. Brendan Buckley, Global Innovation and Prestige Whiskeys Director at Irish Distillers added: “Since its re-launch in May 2011, Single Pot Still Irish whiskey has quickly established itself as the insiders’ Irish whiskey style of choice with the Redbreast brand very much at the vanguard of this revival. 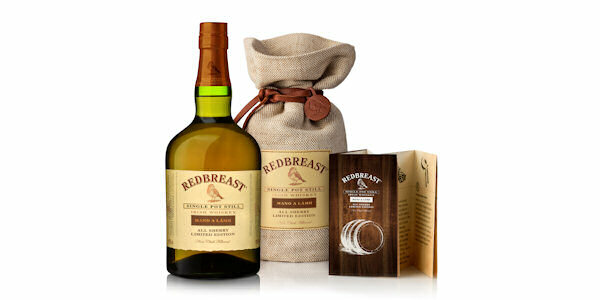 We hope that Redbreast Mano a Lámh will excite whiskey lovers, especially those who enjoy sherried style whiskeys”. Limited to just 2,000 bottles, Redbreast Mano a Lámh is non-chill filtered at 46% ABV and is available exclusively to members of The Stillhouse from February 2015, priced at €65. For more information on Single Pot Still Irish whiskey and to join The Stillhouse, visit www.singlepotstill.com.